As an award-winning design-build company serving communities in Redmond, Bellevue, and the Eastside, we offer our clients a wide range of home remodeling services from the initial design concept to the finished renovation. Our group of highly talented craftsmen will carry out your project with the finest skills that you expect for your home. This one-stop approach allows us to ensure quality from beginning to end while simplifying the overall process for you. Innovative and creative design is an essential part of our remodeling process. Our unique build process starts and finishes with a hands-on approach. Our full-service design-build process encompasses all aspects of your project from initial concept through construction. This welcoming basement retreat is a perfect area for gathering with family and friends. It features a built in entertainment center, deluxe kitchenette with eating bar and custom wainscoting. Finishes include walnut cabinetry, quartz countertops, marble tile backsplash and wide plank oak flooring. A full complement of professional appliances along with a must have kegerator makes this the family's' favorite hang-out spot. This beautiful kitchen evokes a Joie de vivre with its vaulted ceilings, rustic beam and soothing blend of materials. 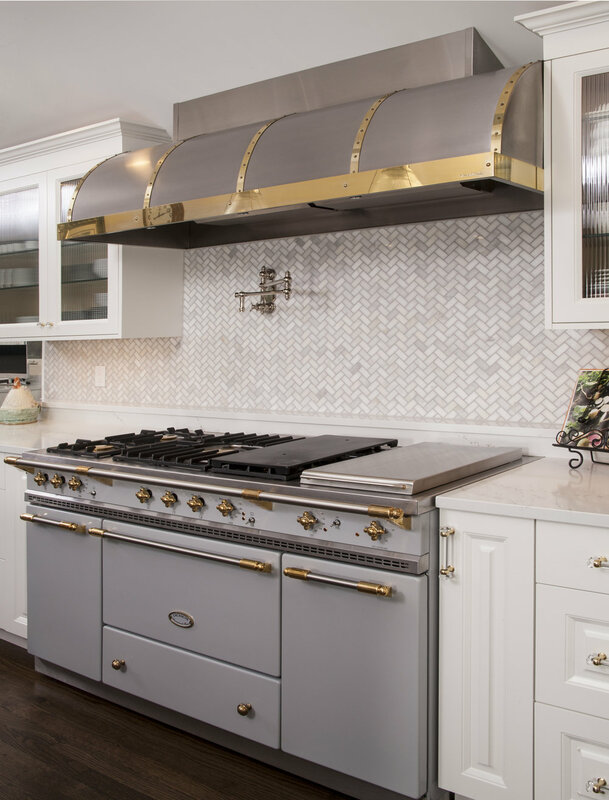 The LaCanche range and custom VentAHood are paired with painted cabinetry, quartz countertops and herringbone marble tile. 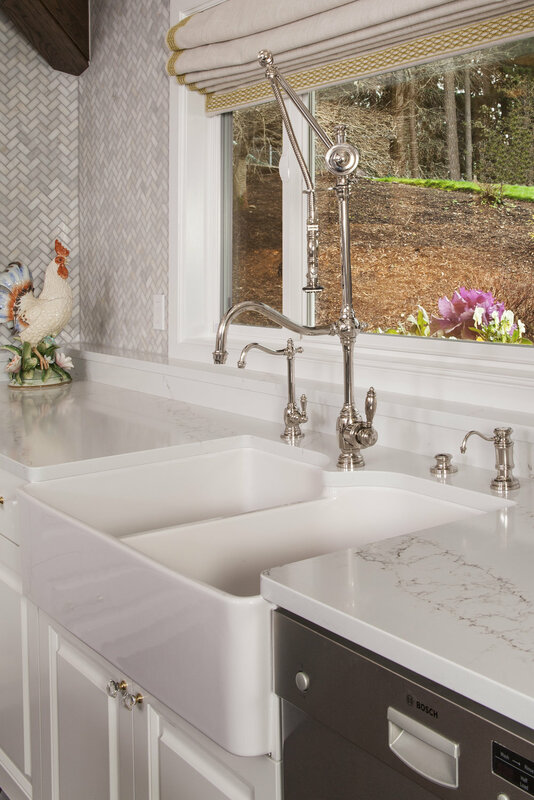 Waterstone faucets and Hudson Valley pendants add the perfect accent touch. The adjacent dining room features a decorative built in hutch for serving and additional storage. A side alcove includes handy desks with a cozy center window seat. An 1100 sq. ft second story addition over the existing garage includes two bedrooms, ¾ bath and bonus loft. This project also incorporated the existing breezeway and yard, approximately 280 sq. ft. into a laundry room and locker area connecting house to garage. The Japanese soaking tub from Victoria & Albert is captured by an intricate tile deck that serves as the focal point of the room. The adjacent shower features full height doors, dual shower heads and a large seat. Dual vanities with center make up area are constructed out of vertical grain black walnut with cherry accents. Vessel sinks with contemporary faucets and sleek quartz countertop complete the dramatic ensemble. Incorporating 50 sq.ft. of existing covered patio along with removing several interior walls created this open concept kitchen. The expansive island features custom gray cabinets, Franke farm house sink and Pental Quatrz countertops. Adjacent beverage center provides additional storage. Enlarging an existing bonus room by 500 sq. ft was the ideal office solution for this thriving home-based business. The new area is spacious enough to accommodate two long arm quilting machines, a combination kitchenette/desk/storage area as well as an oversize table for conducting classes. A separate entrance provides easy access for customers. The new room also features a vaulted ceiling, lots of windows and skylights, hardwood floors and brightly painted walls for a cheerful environment. The project also included new exterior decks and a built in BBQ area.